One of my New Year’s resolutions was to actually get in the habit of posting om my blog more often than once every six months. The problem with New Year’s resolutions is that New Year’s Day comes in the middle of the winter, when all I want to do is crawl back under the covers with a good book — not fix all my bad habits. Which is why I seem to have waited until spring to get around to honoring some of those resolutions. The bright yellow crocuses coming up in our back yard are egging me on. I figure if they can keep blooming even after our dog dug around them, I can put up a blog post. Actually, I’ve had work in a bunch of shows since I last posted, but I’ll just go with the current news, and try to get to filling in later. 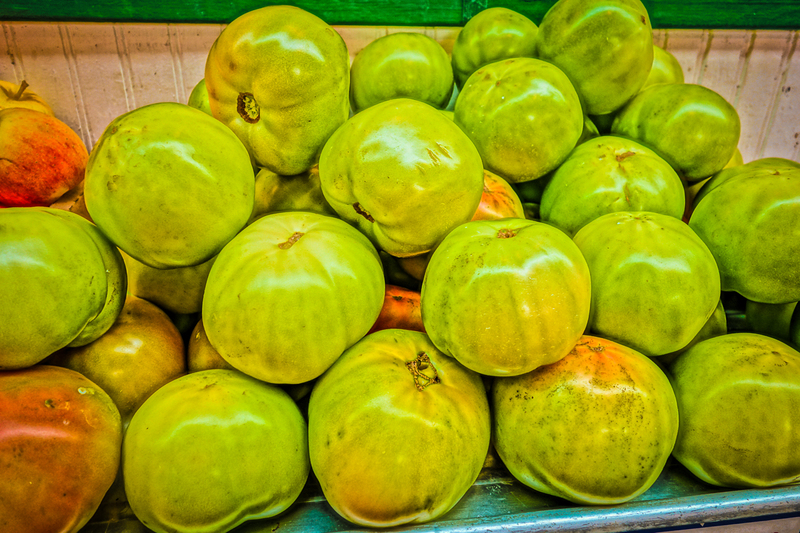 My photo, Fresh Green Tomatoes, is currently in an exhibit on Capitol Hill. My picture was chosen by juror Bonny Wolf to be included in Food for Thought, a show sponsored by the Capitol Hill Art League. It’s a really nice show which runs through April 16, 2015. You can see it at the Capitol Hill Arts Workshop , 545 7th Street SE, Washington DC. a few blocks from the Eastern Market Metro Stations. Please do check it out. Here is the picture. I took it at Eastern Market in 2013.